The earliest known example of such a shell-shaped basket, on cast dolphin feet, is by Paul de Lamerie, now in the collection of the Philadelphia Museum of Art. A later example of 1747 is in the Farrer Collection, The Ashmolean Museum, Oxford, and was exhibited London, The Victoria and Albert Museum, Rococo Art and Design in Hogarth's England, 1984, no. G21. In the catalogue entry Phillipa Glanville suggests that Lamerie was perhaps inspired by earlier Meissen porcelain examples, which were being imported into London in the 1730s. She cites an escallop-shaped dish by Heroldt of circa 1728 with a painted diaper border which bears resemblance to the piercing on the Lamerie baskets (see Pantheon, XV, 1935, p. 203). 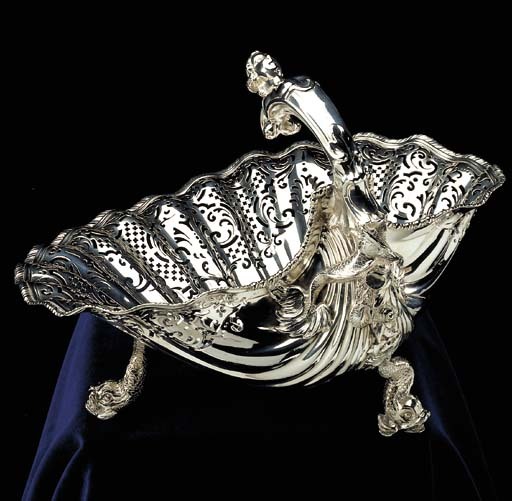 Moreover French silver shell-shaped baskets are thought to have been produced after a design, tentatively attributed to Germain, published by Diderot in Encyclopedie Planches, vol. 8, Orfevres Grossier, Paris, 1771, fig. 5, pl. VI. Phillips Garden purchased Paul de Lamerie's tools and patterns on the latter's death in 1751. Although Edward Wakelin and Thomas Gilpin had produced similar baskets in 1747, there can be little doubt that Lamerie's casts were used by Garden to produce this and other similar baskets (1754 example, Christie's London, 14 July 1995, lot 119 and another, 1755, Christie's London, 8 February 1962, lot 130). P. A. S. Phillips, in his catalogue of the Farrer collection says of this particular basket form that '...nothing more successful as table ornaments ever emanated from the goldsmith's workshop.' Lamerie's casts and patterns enabled Garden to produce objects of high quality and to be in A. G. Grimwade's words 'an admirable exponent of the Rococo style' (A.G. Grimwade, London Goldsmiths, 1697-1837, Their Marks and Their Lives, London, 1982, p. 519). Indeed, M. Snodin, op. cit., p. 120, doubts whether he could have produced such high quality objects as the pair of beer jugs of 1754, sold Sotheby's London, April 1969, lot 192 and illustrated in H. Muller, The Thyssen-Bornemisza Collection, European Silver, London, 1986, no. 13, without the assistance of Lamerie's casts and tools. A bill dated 4th January 1759 for the supply of an extensive dinner service by Phillips Garden to Sir Nathaniel Curzon for his neo-classical mansion, Kedleston Hall, further suggests that Phillips Garden was perhaps more a masterful retailer of pieces by the finest goldsmiths of the day, rather than an accomplished goldsmith himself. The magnificent Venus soup-tureens, one exhibited Christie's, London, Treasures of the North, 2000, no. 134, and the equally unusual flower-bordered dinner service, sold Christie's, London, 30 April 1996, lots 107-118, all appear on Garden's invoice but are in fact struck with a maker's mark of William Cripps.